LeBron James catches the ball on the left wing. Seven seconds on the shot clock. He turns toward Thabo Sefolosha, the Thunder's top defender. Squares him up. Drive, jump stop, fadeaway. The ball kisses off the backboard. All of Oklahoma City goes silent. James' jumper put the Heat up 96-91 with 1 minute, 26 seconds remaining. It's easy to overlook the key part of the play: He didn't get the ball until seven seconds remained on the shot clock. All the pressure on James in Game 1, that 105-94 Heat loss, was gone. Dwyane Wade and Chris Bosh were outstanding in Game 2, carrying Miami with 23 points and 15 rebounds in the first half, 40 and 21 for the game. Shane Battier scored 17 points for the second game in a row. All that made it possible for James to save energy and disprove his biggest critics. 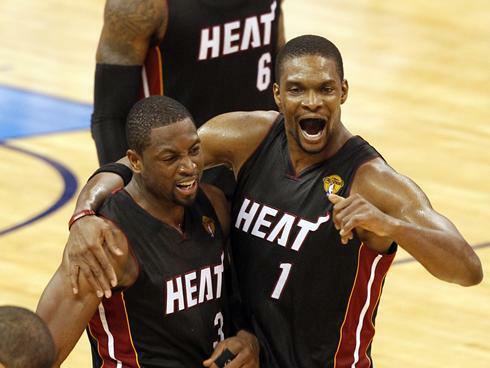 The 44 hours prior to Game 2 had been rough for Wade and Bosh. They were miserable Tuesday, shooting 11-for-30 from the field and doing nothing down the stretch as Miami fumbled the game away. Charles Barkley compared the duo to Tito Jackson. Not Jermaine. Not even Marlon. But Game 2 was always going to be different. Bosh took the opening tip for the first time since Game 1 of the second round. (He had been coming off the bench since returning from an abdominal strain suffered in that game.) Bosh was relentless. He moved into the paint and never left. In the second quarter, playing entirely against shot-block king Serge Ibaka, Bosh had six points and seven rebounds. He had 15 boards by the end of the night, seven on offense. The Heat were plus 11 with Bosh on the court and plus 10 with Wade, who finished with 24 points, six rebounds and five assists. Their play freed James up. That's how it's supposed to work: Three superstars trade big plays to get each other open shots. All the help kept James fresh and focused. He let out a scream at Mario Chalmers late as the Thunder pushed back, but he was cool and collected in hitting two free throws to seal the win with 7.1 seconds remaining. James gets killed for not showing up in high-pressure situations and for missing too many free throws. Thursday, he had 18 points, seven rebounds and four rebounds in the second half and made all 12 of his free throws. 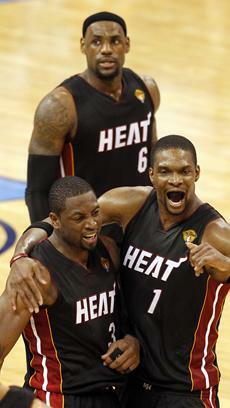 That's what can happen when Wade and Bosh help, what didn't happen in Game 1. Tito came through. And LeBron James killed the solo. Russell Westbrook, he of the T-shirts, refuses to admit he's having a bad night. And that can help or hurt the Thunder. The 23-year-old point guard was 2-for-10 in the first half, but instead of switching gears, he attacked more. Oklahoma City is 29-8 this season, including the playoffs, when Westbrook takes more shots than Kevin Durant, according to the Elias Sports Bureau. But he's done so in three of the team's four postseason losses. In Game 2, he shot 8-for-16 in the second half, finishing with 27 points, eight rebounds and seven assists. He wasn't at fault for the loss. And he'll keep on shooting either way. So we head to Miami for three games. It's never made much sense that the Finals are set up this way, where the team with homecourt advantage must play Games 3, 4 and 5 on the road before returning home for Games 6 and 7. But it does add an interesting dynamic: The Heat know that if they blow one of these games, they'll have to close the Finals on the road. And the Thunder know they have to win a road game in order to stay alive. Based on the first two games in this series, we're guessing it closes, one way or another, in Oklahoma City. Ibaka had five blocks but not much else. The Congolese 22-year-old built his all-defense first-team reputation on his wingspan and leaping ability, but he's normally a significantly better rebounder than he showed in Game 2. Bosh was aggressive and physical while still pulling Ibaka away from the basket on help defense. But Ibaka can't disappear. His blocks, including three on James, were as awesome as ever. But he shot 2-for-5 from the field and was outhustled routinely by Bosh. Where's the player who went 11-for-11 in Game 4 of the Western Conference finals?